Pastor Heath O. Mills is the Leader of Full Gospel Holiness Outreach Center, Located in the Tamina Community, near The Woodlands, TX. Pastor mills, is a second generation guitar playing singing Preacher...let the music play, let the word be told! The Music of Pastor mills is rocking socking gospel. His deep baritone voice and soul stirring guitar phrasing is well known around Montgomery County,TX. 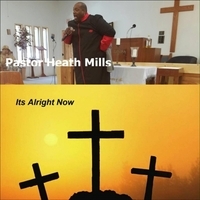 Like his father before him (Pastor Ernest Mills) he adds his music while telling a Gospel story. Though it is Gospel music, one can not use the term "traditional" Like most contemporary music, gospel, in many cases, has become "generic" sounding. If there is anything that one takes a way from a song by H.O. Mills, it would be it is vastly different than what is expected from that genre of music. I love this sound, it is soul stirring. I certainly appreciate all types of Gospel Music, but I think we are "floating" away from what brought us so far. Good ole foot tapping , hand clapping Gospel.